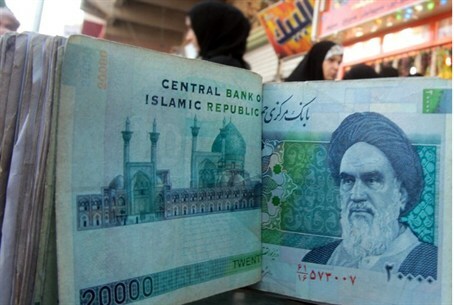 Iran's rial dives six percent to a new low of around 28,600 to the dollar. Economy minister says sanctions are hurting 'the enemy'. Iran's currency, the rial, dived six percent to a new low of around 28,600 to the dollar in open trading on Saturday, deepening a month-long sell-off, AFP reports. The new rate was sharply lower than the 26,900 rials per dollar fetched on Thursday, the last day of trading. The plunge -- and a steep rise in the price of gold bought in Iran -- suggested Iranian families and companies were rushing to convert their money to dollars, other foreign currency and precious metals because of economic uncertainty. The rial has lost over 60 percent of its value since the end of last year, as draconian Western economic sanctions take effect. That has spurred already high inflation to even greater heights, with food costs soaring more than 50 percent. Just last month the Iranian currency sank to an historical low of 21,510 per dollar, forcing dealers in Tehran's major currency trading district to stop selling dollars. Iran, which denies Israeli and U.S. allegations that it has nuclear weapons ambitions, has made some efforts to mitigate the weakening of the rial, but to little durable effect. The head of Iran's central bank, Mahmoud Bahmani, predicted on Saturday that the rial's slide would be halted once the market realized the country "has enough (foreign) currency in reserve," according to the AFP report. The report added that this week Iran opened an "exchange center" which puts importers and exporters in touch which each other to arrange informal swaps of currency aimed at skirting U.S. financial restrictions that curb the ability to repatriate money to Iran. Meanwhile on Saturday, the Iranian economy minister suggested nothing was wrong in his country and said the economic sanctions imposed by the West against Iran have backfired, as they have intensified economic crisis for its enemies. The Fars news agency quoted Minister Seyed Shamseddin Hosseini as having told a ceremony in north Iran that enemies are plotting against Iran every day but to no avail. "They are trying to isolate Iran but the Islamic Republic of Iran hosted a successful Non-Aligned Movement (NAM) summit," he said, pointing to another instance of enemies' futile efforts against Iran.